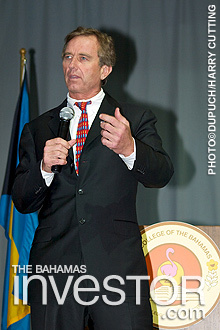 Environmentalist lawyer and nephew of John F Kennedy made a keynote presentation at the College of The Bahamas yesterday on environmental issues. 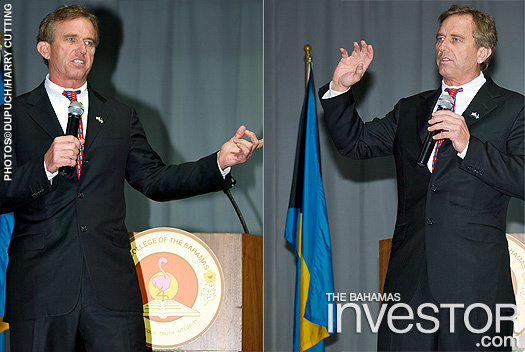 The Bahamas needs to reduce its dependency on oil and explore more environmentally sustainable sources of energy, according to leading environmentalist lawyer Robert F Kennedy Jr. Speaking at the College of The Bahamas (COB) yesterday, the environmental activist urged Bahamians to protect their natural resources and safeguard their marine life by weaning themselves off oil and onto solar power. Kennedy said the power plant at Clifton Pier was a serious polluter and called for greater environmental protections to prevent the water on the south side of New Providence from becoming more polluted. “There used to be a giant forest of elkhorn coral down there. Now there is not a single piece of living coral left,” he said. Kennedy also spoke of his work as president of the Waterkeepers Alliance, a foundation set up to monitor waterways via patrol boats and take action against any polluters. There are 200 waterkeepers around the world. “We look forward to the day when every water way has a waterkeeper, including The Bahamas,” he said. Kennedy was invited to speak at COB as part of the institution’s mandate on environmental issues. The college runs a Small Island Sustainability Programme and is a member of the College & University Presidents’ Climate Commitment, which calls for a move to carbon neutrality. Astronaut Chris Hadfield has posted a picture taken from the International Space Station of the Tongue of the Ocean and Andros island in The Bahamas. See the picture here.